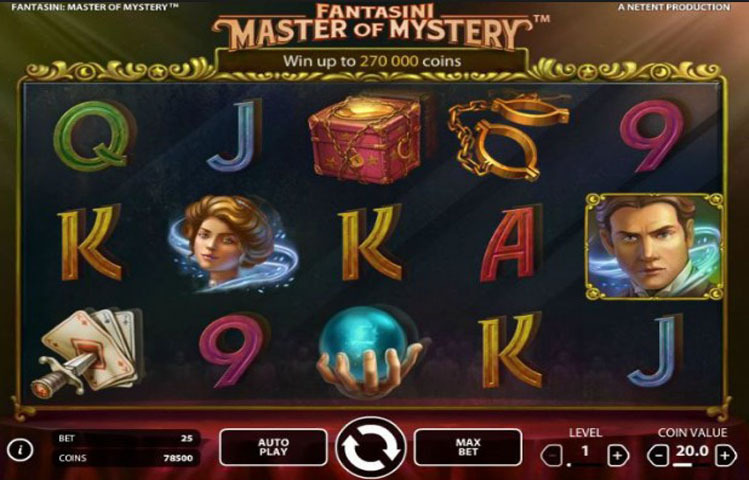 Fantasini Master of Mystery video slot game was released in January of 2015. The game was created by Net Entertainment. It is a tribute to the infamous Harry Houdini. Even though his name is never mentioned in throughout the game, it’s pretty much a given based on the themes. The symbolism and legendary tricks are undeniable. From the escape acts to the emblematic moves, it’s a great slot to play from start to finish. One thing that this game really has going for it is the good graphics. Because of its setting in the world of magic, it uses mystic music and out of this world graphics to enhance the player’s experience. There are 243 ways to win. To win this game, the player needs to get three or more of the same symbol. It is set up typical to other games with 243 ways to win. The player can bet up to 25 credits for each spin. The spin value is selected before the reels turn, which is when the player sets the maximum bets. Using the max bet option is a nice way to keep betting. However, the coin value won’t change from what it was originally set on. Auto-play is another option that suits those who want to play the same bet over and over. There is an option to play the same hand up to 1,000 times on auto spin. If the player should win, they can set the machine to stop and increase or decrease the amount of the bet. If the player noticed that on each spin they have two identical reels, this means that they have increased odds of winning. Players have a large selection when it comes to betting. A single spin can range from $.25 all the way up to $125. The coin value is also adjustable from $.01 to .50. The bet level range is from 1 to 10. With every spin, it is charged as if the player is playing at the fixed 25 pay-lines. This game does not have any bonus game section or free spins. The fantastic Linked Reels Feature doesn’t allow for these extras. The symbols used in this magic-themed game are well done. The magician is the wild card, and if this symbol appears on the reels, good things can happen. However, it is not an automatic win. The girl is the most generous of the symbols. If she pops up on the slot the player will get a jackpot of $1,000. Be on the lookout for the chained box, handcuffs, a magic bowl, and the stabbed cards. The linked reels feature is nice and gives two identical reels surrounded by some chains. This gives players the options to see triplet or even quintuplet reels. Gamers can play this game on their tablet and smartphones as well. It is well set up and the appearance and excitement on the smaller screen are just as good as it is on the bigger computer screen. The Master of Mystery is not an aggressive video slot, nonetheless, it is very entertaining and can be played for long periods of time. It has a nice background theme and much mystery surrounds the entire game. Players have the option to get a decent payout, and it is a simple game to play. Most of the action is done in the main game, though the linked reels to add a nice refreshing flavor to the already great slot.